ThirstEnders International Corporation is a manufacturer of proprietary, mobile delivery systems for food, beverages and consumer products. ThirstEnders' products are innovative, high-quality, cost-effective and are utilized by the major international beverage companies such as Coca-Cola, Pepsi-Cola, Anheuser-Busch, Allied Domecq, CarlsBerg Brewing, Kraft General Foods, Nestle and United Distillers and Vintners. ThirstEnders International Corp. is a privately held Texas corporation founded in 1985 by William O. Ash, Jr.. 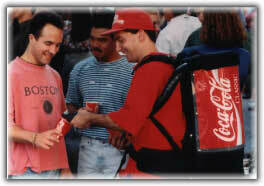 Founded in 1985, ThirstEnders originated, patented and pioneered the development of backpack mobile delivery systems for food, beverages and consumer products. We are the only provider of backpack systems that have been formally tested and approved by the major beverage companies, including Coca-Cola, Pepsi-Cola, Anheuser-Busch, Procter & Gamble, Kraft General Foods and others. Ergonomically designed to ease the burden of the vendor, our backpack systems allow the stadium vendor to carry more product, deliver it faster and work safer and longer than any other system. Our "walking, talking billboardsTM" are currently in service in many of the major stadiums in the United States (ThirstEnders' Venues) operated by the major concessionaire companies in cooperation with the major beverage companies. Further, our systems are the ideal method for product sampling programs designed to reach consumer's in large crowds, busy street corners, supermarkets, chain stores or membership clubs. 4,869,402; 5,199,609; 5,611,457; 5,772,075; 5,826,746 and design patents 342,412 and 355,297. In addition, the Company and its licensor have several patents pending on its products. The Company is committed to protecting its patent rights and will fully defend all such patent rights.